Material:The potatoes which are palate soft and chewy ,and match to the soup absolutely. 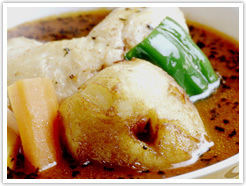 Among the topping of soup curry Cocoro¸the most popular one is potato. Varieties of ” No. 50 North Sea” ¸what breed is unfamiliar because it is a special breed that are not on the market. Potatoes that do not taste almost unobtainable in general only in soup curry Cocoro. 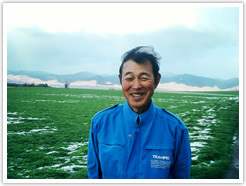 Mr. Ueno contract farmers of the town Kyowa has been dedicated to the production of potato only for soup curry Cocoro. Compared to traditional potatoes such as potato baron this kind of potato was flaky and sticky. Order to take advantage of the characteristics of the potato¸after it was boiled under whole¸in our shop¸we offer the lightly fried. Because the breed is fine organization¸does not blend into the potato soup while you’re eating¸I bring out the flavor of the soup until the end.